I tried so hard to post every day this week, but I failed yesterday. I just can't find time to do anything anymore. I did, however, get First Runner Up in The Coast's Best of Halifax reader's poll for Best Local Blog! So thanks to everyone who voted for me. I didn't even know that was a category this year! The Ressurection of Ra's Al Ghul continues. I don't know why this is "Part 1 of 7" when there were two parts last week. 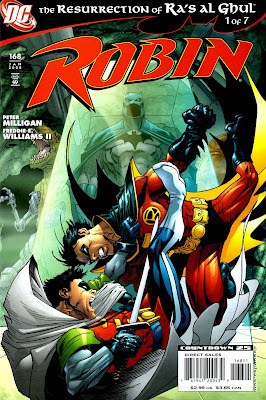 Does that mean there are going to be 7 issues of Robin alone that tie into this thing? 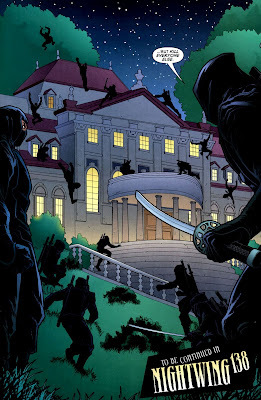 So Damian isn't so into Ra's Al Ghul's plan to use his body as a host. 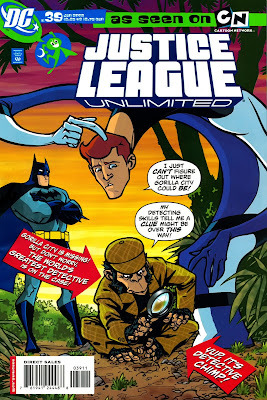 So he hightails it to Wayne Manor to find his dad. 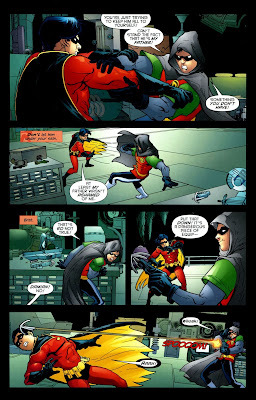 Instead he runs into Robin, and Tim isn't happy to see him. They get into it. 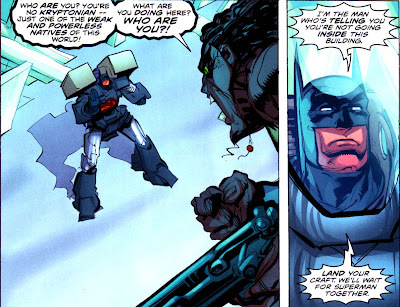 Then Damian runs upstairs and finds Alfred, who is awesome. 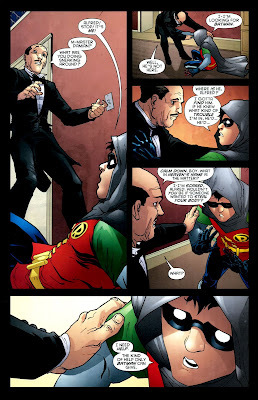 This is actually where I start to feel kinda bad for Damian. Maybe the kid isn't pure evil. Oh, kid. How many times have I said that? 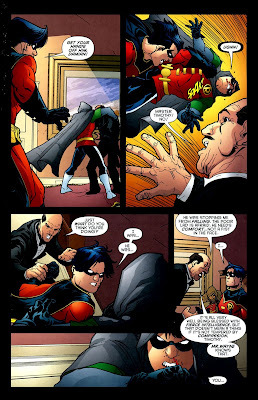 Tim wakes up after being knocked unconscious, and mistakes Damian helping Alfred up after he trips for Damian trying to kill Alfred. Oops! Aw, man! Continued in Nightwing? I have to read Nightwing?! Sheesh. That's like "To Be Continued in Trigonometry Class." Boooooo. 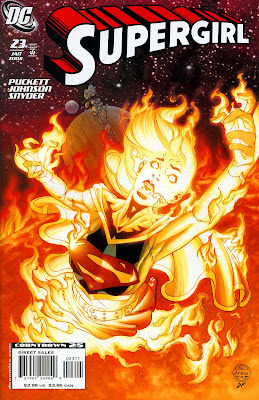 Yet another creative team for Supergirl. I really like the art. 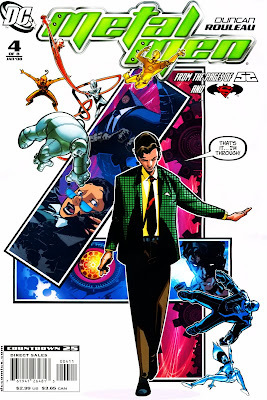 I think the writing is good...but I had no idea what was happening in this issue. I read it twice. No idea. But I still think the writing is good, because the characterization is good. 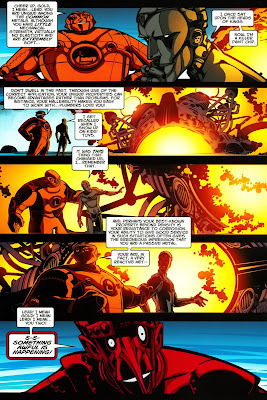 And it kinda tied into Sinestro Corps, but not enough to put that on the cover. 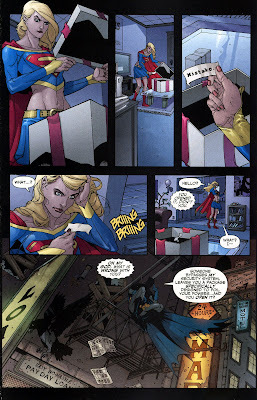 It started off in Supergirl's apartment, which I thought was cool. She has a mysterious present on her coffee table. It's lead and soundproofed. She finally just decides to open it. This gets her a phone call from Batman. 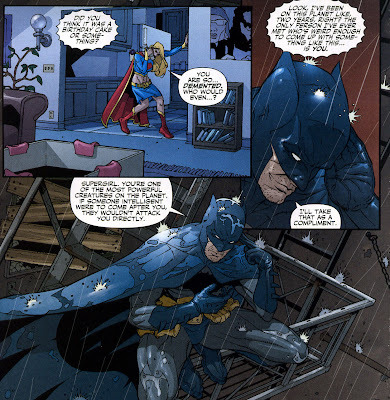 And here is what Supergirl is good for: calling Batman on his creepy weirdness. She's right, Batman. Who would actually tie a box up with a big pretty bow? 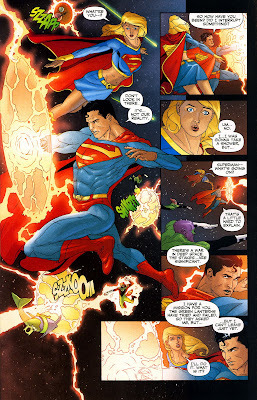 SG gets the call from Superman and soars into battle. Overall, I think there's hope for this comic. Oh man, this was great! 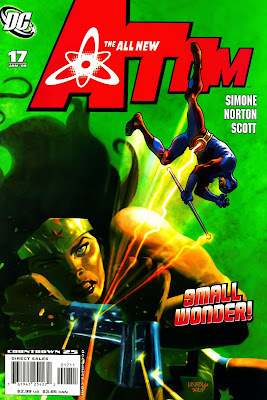 Wonder Woman makes an appearance, giving us a taste of what's to come in Simone's upcoming run on WW. I'm excited. Ha! You tell 'im, Diana! 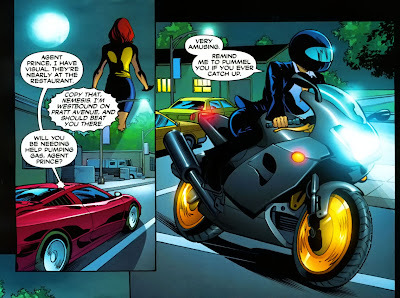 She looks so dope on that motorcycle! This issue gives us more of the Ryan/Giganta relationship, which, as it turns out, is still happening. Fantastic! Short Guy/Tall Woman, Super Hero/Villain. I love it. 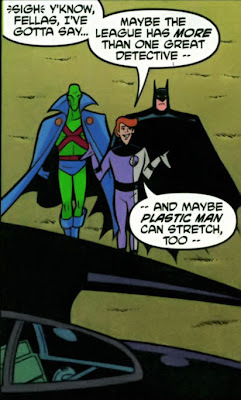 You put Batman and Elongated Man together, and you know you're going to have a good time. 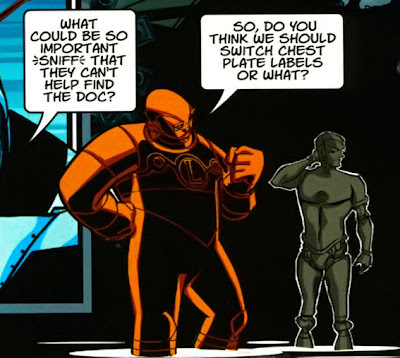 Throw Detective Chimp into the mix, and you have a party. Also, as I've mentioned before, this is the only comic that completely ignores all the depressing continuity and offers month after month of fun stories about dead characters. I love it. Batman feels the same way about Ralph's gross nose that I do. I'll add it to the list of things we could talk about on our date. 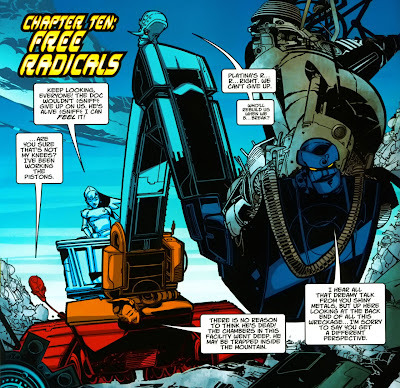 Another beautiful issue of Metal Men, which should win awards for the covers alone! This is going to make a gorgeous book when it's collected. Gold and Lead have exchanged identities, and Lead (now Gold) is trying to cheer his friend up. It's pretty cute. God, this comic is just so beautiful! I can't stand it! 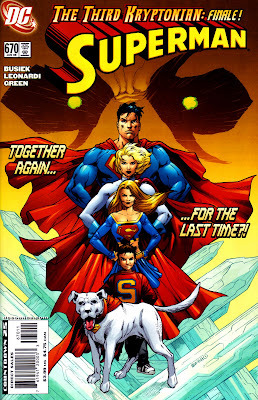 The Third Kryptonian...again, a very confusing concept, considering there are five Kryptonians on the cover, none of which is the "Third Kryptonian." That is a suit that Superman designed and built. It is constructed to recognize Batman's biometric signature. So in love. Actually, this comic did come dangerously close to Jeph Loeb-levels of Superman-crushing-on-Batman-through-obsessive-interior-monologues. 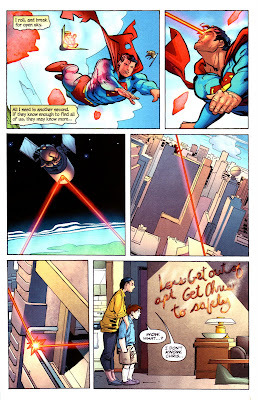 Superman was thinking of him almost constantly throughout the issue. So now the Third Kryptonian is gone. We hardly knew ye, What's-her-name!